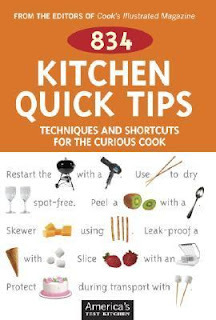 The Editor’s of Cook’s Illustrated have compiled techniques and tips for solving common kitchen problems in preparing and serving meats, fruits, vegetables, spices, and condiments. Did you know you can restart a barbecue grill with a hairdryer, soften butter with a rolling pin, or prevent scorching a saucepan using marbles? These unique tips and many more are in this handy volume. Initially I picked up the book to see how to easily peel peaches, but then I was so fascinated I had to read through each and every tip. This would be a great gift for novice and experienced cooks alike!